Apartments in this particular area are lining up perfectly across the canal. You cannot find anywhere such unique apartment construction and the world-famous canal belt that makes Amsterdam really distinctive. Naturally, the residences in the Central district of Amsterdam have their own pride, since it is a prestigious area to live in, numerous numbers of famous Dutch persons live here too. Central area of Amsterdam is well – known as an upscale neighbourhood and superb amenities within close proximity. This particular area offers distinctive value to its occupants. As expected, apartment prices in this part of the city centre reflects the neighbourhood desirability and high demand while parking options are quite limited and expensive. In fact, residents may have to wait for years to acquire a parking permit and unfortunately, the only nearby (short walk and / or cycle distance) alternative option is to use one of the available (and expensive) parking garages. A very romantic location for whoever wants to experience the dream – like atmosphere of Amsterdam, it is also advisable to take a walk during evening too to watch few romantic lights across the historical bridges on the canal. Right next to the main canal rings is the charming Jordaan – the old, working-class neighbourhood of Amsterdam – which consists of small canals and streets (overlooking the Prinsengracht) and hosts numerous cosy restaurants, cafe and well-known markets (Saturday and Monday). Again, parking is limited and expensive without permit. 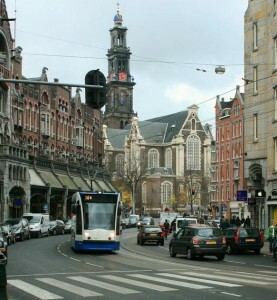 However, there are some Amsterdam neighbourhoods which have easier parking access.